of keeping fast-revving engine from pushing tach needle past the 9,200 redline. Big-bike power in an intermediate? Right-that's Honda's new 500 Four. 0ne of the sweetest pieces of motorcycle engineering to come down the road lately is the Honda CB-500. Super-bike performance without bigbike weight and cost- that's what you get. Four little 2.2-inch-diameter pistons operating in 30 cubic inches of space churn out 50 hp at 9,000 rpm. The tach redlines at 9,200. 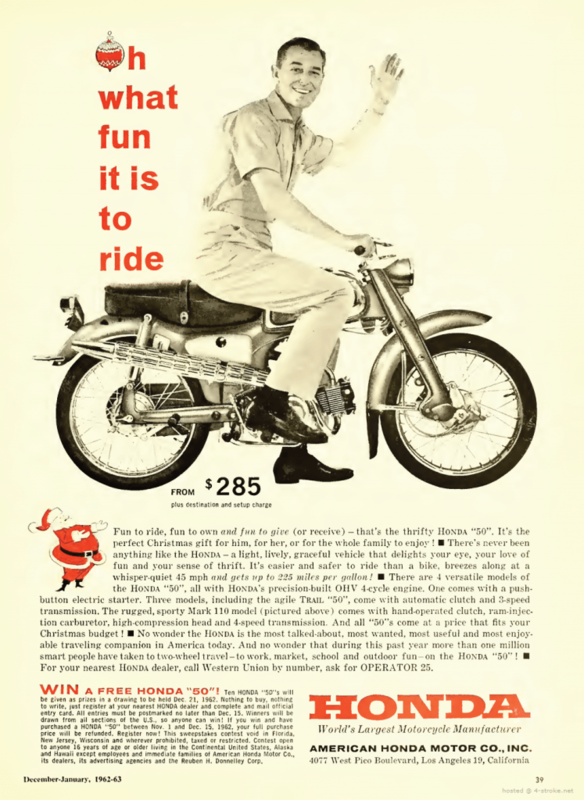 But the four-carb, four-stroke OHC engine accelerates so fast it's hard to stay out of the red. neutral position, high beam. Brake reservoir is at right. On a test track I made a couple of leisurely practice laps, then barreled into a curve at 80 mph. Downshifting into fourth, I leaned, rolled on the gas, heard something scrape, shifted into fifth, and the next time I looked at the speed needle it showed 100 mph down the straightaway. front wheel. Author made panic stops without fade. What happens if you have to stop all this power in a hurry? On the front wheel there's a hydraulically operated disk brake equal to the best stoppers on the road. If you grab it too hard, you can find yourself staring back at the headlight. When it's cold, the 500 takes a few seconds to start. When warm, a tap on the starter button is enough. The engine runs very quietly-so quietly, in fact, that stopped in city traffic, I sometimes had to strain to hear it. Even under heavy acceleration the engine is impressively quiet and vibration-free. five-speed gearbox, the 500 makes riding on two wheels a joy. This little powerhouse shoots through the quarter-mile at about 90 mph in 14 seconds. During the coming year, it'll probably shoot through some sales records. Yep, Honda's struck gold again. Oh you wanted even more manuals? Sure!